Shihan Denis Cordeiro has been practicing karate from a very young age under the direction of Hanshi Manny Matias. Passionate about this martial art and excellent teacher, he has run his karate school since 1998. Shihan Denis is a dedicated instructor, highly appreciated by his students who are increasingly numerous. Shihan Denis works constantly to promote karate as a first rate physical activity and a great competition sport. He has organized numerous world class karate championships. He is a businessman and a man of action who knows how to put his entrepreneurial skills at the service of his art! Shihan Denis started practicing karate with Hanshi Manny Matias when he was only six years old. His love of karate and his mental and physical aptitude for training have successively led him toward competition and a career in teaching the art of karate. At 13, still under the guidance of Hanshi Manny Matias, Shihan Denis intensified his karate training. He joined a school in Laval (Quebec) that was part of the Kyokushinkai Karate Organization. The North American Branch of this worldwide organization was directed by Grand Master Shigeru Oyama. Grand Master Shigeru had been sent to North America from Japan by Mas Oyama, founder of Kyokushinkai Karate in Japan, to pass on the virtues of traditional Japanese Kyokushinkai Karate. As he grew up, even though he lived and trained mostly in Québec (Canada), Shihan Denis kept close to Hanshi Manny and visited him regularly in Connecticut (USA) to perfect his technique. He followed Hanshi Manny when he joined the World Oyama Karate Organization newly founded by Great Master Shigeru Oyama. 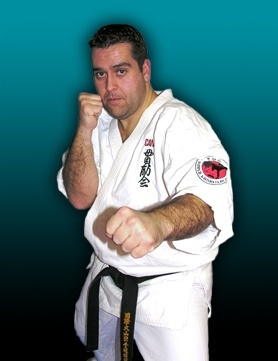 Shihan Denis went to practice his art in Repentigny (Quebec) at a new school affiliated with the Oyama Karate Organization and also trained regularly with Hanshi Manny Matias in CT.
During those forming years, Denis Cordeiro became a successful businessman. He is currently the owner and manager of Autotech Performance, an auto mechanics center located in Pierrefonds (Quebec). In May 1998, one of Shihan Denis Cordeiro’s dreams came true: Soshu Shigeru Oyama officially inaugurated Shihan Denis’s dojo in Montreal West Island. Since then, Shihan Denis has been teaching karate to an ever increasing number of students, several of them having reached the Black Belt level. The interest and enthusiasm of his students have kept him motivated. He finds that each student contributes to making him better, not only as an instructor, but also as a person. He is inspired by the ardour and desire to learn of his young students and by the wisdom and determination of the older ones. In July 2004, as Soshu Shigeru Oyama closed his New York dojo and stepped down as director of the organization, Shihan Denis worked with his long-standing instructor Hanshi Manny Matias and Sensei Robert Underhill to start the World Kanreikai Karate Organization. As a founding member and current president of the Organization, he has been essential to its development worldwide. Shihan Denis’ achievements are many as a fighter, a teacher, a trainer and a leader. Always eager to promote the art of karate, he has been organizing and hosting a major annual karate tournament in Montreal West Island since the year 2000. Every year, an ever increasing number of participants of all ages and ranks from Canada and the Northeast of the United States, gather to compete in the YUKAN Karate Championship. Shihan Denis has also organized several editions of the YUKAN and Dagéki International Knockdown Karate Championships, great karate shows that feature world renown knockdown fighters. Today Montreal Kanreikai Karate is a dynamic school ever growing in popularity. Shihan Denis teaches karate according to the World Kanreikai philosophy: one doesn’t quit when faced with obstacles but works harder and reaches beyond his or her limits, whether in martial arts or in everyday life. This is entirely in accordance with Shihan Denis’s ideals and with the way he leads his students and acts in life.